On Monday 20th February, the Cheam High School Jack Petchey Winners from 2016-17 were welcomed to a celebration event with parents/carers and teachers in attendance to cheer them on. Our wonderful winners took to the stage to be presented with their medals by the Deputy Mayor of Sutton. All students were a credit to the school and we are very proud of them and their continued effort and determination in all that they do. It was a privilege to be there to see these students receive their awards and, for the young people, we hope this will be a cherished experience. Additional congratulations to Alex who was asked if his story could be used by the foundation in their publicity materials because they were so taken with his achievements. Well done to all the winners! The Jack Petchey Award continues to run; look out for notices about when you can nominate a young person for the award this year. The school has been part of the Jack Petchey Achievement Award Scheme since 2011. This is a reward and recognition scheme for schools and clubs to help celebrate the achievements of their students. 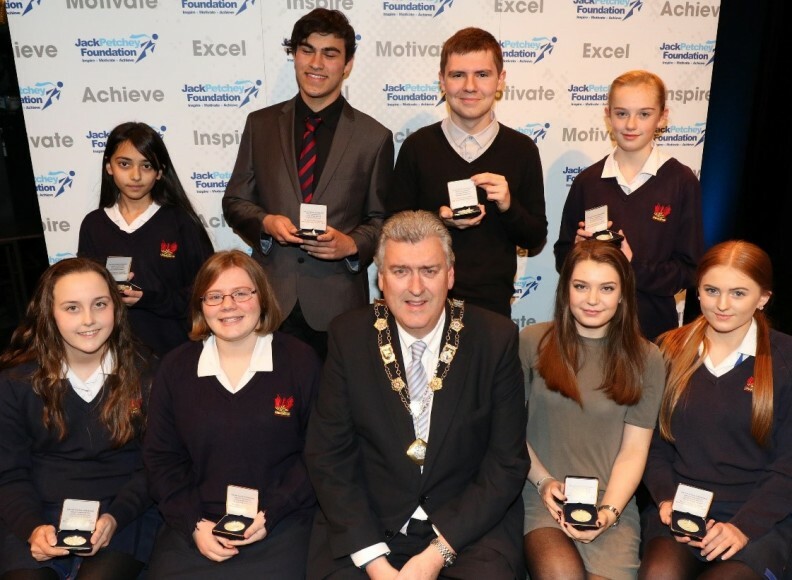 At the start of each term, students, staff, parents/carers and governors are invited to nominate students for a Jack Petchey award. Students can qualify for an award in a variety of ways, for example: improvement in a subjects; performance in a lesson; kindness to others; work within an area of the school e.g. extra curricular clubs; supporting other students; improved effort attitude and many others! Once nominations are in, the Student Council and, where appropriate, previous Jack Petchey winners, decide who the winner is. It is not a popularity competition and a student can only win one award in their school career. The winner receives: a framed certificate, a pin badge, and £200 to be spent on a school or community project of their choice. The other nominated students are given a small amount of money that they can spend within the school community. Nomination forms will be available from the LRC. Tutors also have copies and the form is available on the VLE for students. Parents/carers can download the form at the bottom of this page. Having read the anonymised nominations, the School Council decided Rebecca (7IM) should receive the Jack Petchey award. Rebecca was nominated by her peers for her supportive and caring nature and her positive attitude ‘at every moment’. For winning this award Rebecca will receive a framed certificate, badge and membership to the Jack Petchey Foundation. Additionally, she receives a £250 donation from the Jack Petchey Foundation to spend on an event or resources for the school of her choosing. Rebecca has chosen to spend the money in the Drama department. Well done Rebecca! Having read the anonymised nominations, the School Council decided Mariam (7BD) should receive the Jack Petchey award. Mariam was nominated by her peers for her excellent attitude. She is praised for being hardworking and always being motivated to get involved and participate. For winning this award Mariam will receive a framed certificate, badge and membership to the Jack Petchey Foundation. Additionally, she receives a £250 donation from the Jack Petchey Foundation to spend on an event or resources for the school of her choosing. Well done Mariam! Having read the anonymised nominations, the School Council decided Brandon should receive the Jack Petchey award. Brandon was nominated by his peers for his kindness and helpfulness. The nomination read that ‘there isn’t a word for how kind he is’; quite the accolade! For winning this award Brandon will receive a framed certificate, badge and membership to the Jack Petchey Foundation. Additionally, he receives a £250 donation from the Jack Petchey Foundation to spend on an event or resources for the school of his choosing. Brandon has decided he wants to spend the money on some table tennis resources. Well done Brandon! The school council selected Jake (Year 12) to receive the Jack Petchey award. Jake was nominated for his excellent attitude and efforts since joining Cheam in the Sixth Form. His n o m i n a t i o n praised his great help to the Technology department – volunteering at open evenings and each night of school productions. He has completed ten hours of volunteering within the department and continues to help out in any lower school practical lessons where he can and to mentor two boys from the lower school once a week. He has also signed up as a Youth Ambassador for the Daniel Spargo Mabbs Foundation - this is the sixth form charity for this year. Jake helps at evening and weekend events; this can be anything from walking around shopping centres with a bucket collecting money to helping to set up talks and working with groups of young people. Jake is also a competitive swimmer - he has reached county level competitions and he is also a swimming teacher. For winning this award, Jake will receive a framed certificate, badge and membership to the Jack Petchey Foundation.Additionally, he receives a £250 donation from the Jack Petchey Foundation to spend on an event or resources for the school of his choosing. Well done Jake! The school council decided Isabella (Year 10) should receive the Jack Petchey award. Isabella received her nomination for her great efforts including in securing her work experience placement at a computer games/software engineering company. After many knockbacks from computer games companies and software engineering companies, Izzy kept going and secured work experience at The Software Bureau in Purley Way. She was the first student they have taken on for work experience. She showed such enthusiasm for computer programming that they have given her training in different programming languages, including giving her the opportunity to make her own game from scratch. framed certificate, badge and membership to the Jack Petchey Foundation. Additionally, she receives a £250 donation from the Jack Petchey Foundation to spend on an event or resources for the school of her choosing. universities as well as degree apprenticeships. He is also praised for his extra-curricular efforts in the sixth form football team, where he has been part of successful seasons, reaching late stages in Cup competitions. Harry helps out at school events and his nomination really focused on his impressive ability to manage all of his commitments with a positive outlook. For winning this award, Harry will receive a framed certificate, badge and membership to the Jack Petchey Foundation. Additionally, he receives a £250 donation from the Jack Petchey Foundation to spend on an event or resources for the school of his choosing. Well done Harry! The school council decided Kiera should receive the Jack Petchey award. Kiera is a Sports Captain. As part of her role she is now running a Year 7 netball club; planning and confidently leading weekly sessions to help students toprogress. Without her help the PE team, who nominated her, said that they would not be able to maintain the high levels of participation in netball. For winning this award Kiera will receive a framed certificate, badge and membership to the Jack Petchey Foundation. Additionally, she receives a £250 donation from the Jack Petchey Foundation to spend on an event or resources for the school. Kiera has, fittingly, chosen to spend the money on equipment for the PE department. Well done Kiera! The school council decided Mia D (11HL) should win the Jack Petchey award. Mia’s nomination highlights her as an outstanding GCSE PE student, who works exceptionally hard in lessons and also carries out a huge range of extra-curricular activities. She has qualifications in both gymnastics and trampolining and coaches both inside and outside school. She completes two hours of trampolining per week including one hour leading and represents the school in competitions. She trains four hours per week in gym and coaches at a local club for a further four hours. Mia is an excellent leader and is extremely conscientious. She is a pleasure to teach and a credit to the school. For winning this award Mia will receive a framed certificate, badge and membership to the Jack Petchey Foundation. Additionally, she receives a £250 donation from the Jack Petchey Foundation to spend on an event or resources for the school. Mia has, fittingly, chosen to spend the money on equipment for the PE department. Well done Mia! The school council has decided that Lution should receive the Jack Petchey award. The council received a number of nominations for Lution which highlighted his 100% attendance; volunteering with Year 11 VISA, Scouts, Young Leader and Duke of Edinburgh Award; his talent and dedication in his studies and for being a role model with his high expectations and aspirations. For winning this award Lution will receive a framed certificate, badge and membership to the Jack Petchey Foundation. Additionally, he receives a £250 donation from the Jack Petchey Foundation to spend on an event or resources for the school. Well done Lution!